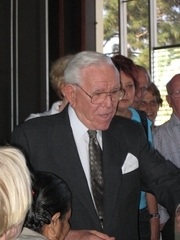 Robert H(arold) Schuller is the founding pastor of the Crystal Cathedral. Robert A(nthony) Schuller, his son, also writes books stressing success through spiritual positive thinking. The senior Schuller seldom used his middle initial or name until the younger began publishing. Robert H. Schuller is currently considered a "single author." If one or more works are by a distinct, homonymous authors, go ahead and split the author. Robert H. Schuller is composed of 13 names. You can examine and separate out names.